To quote the Cheshire Cat from "Alice in Wonderland" - "Every adventure requires a first step." This darkness defying writing and drawing set contains everything you need to unleash your creativity, with the lights on or off. 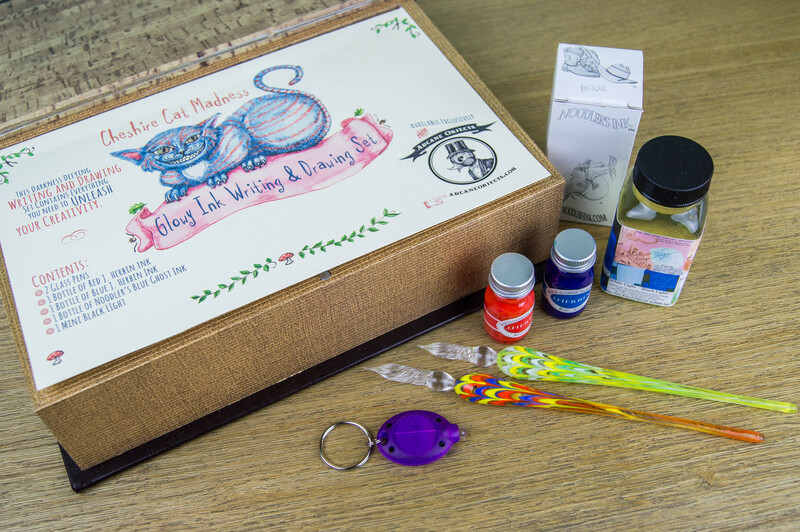 We've put together some supplies to enhance your creativity by including drawing or writing dip pens with ink that glows in the dark or with a black light. Plus, we're throwing in a black light flashlight. This glowy ink pack comes contained within a handsome box made to look like an antique leather-bound book. This "book" box is made of wood covered with gold embossed, brown vegan leather and closes with a magnetic clasp. 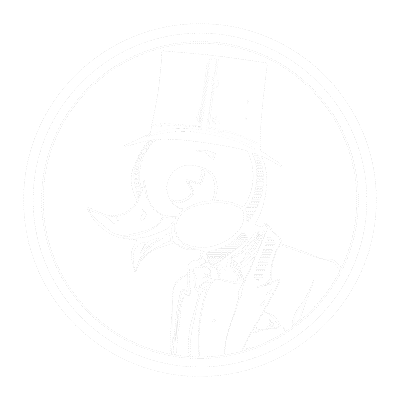 • 1 (one) 3oz bottle of Noodler's Blue Ghost Black Light Ink OR 1 (one) bottle of J. Herbin Phosphorescent Ink. • 2 (two) Glass dip pens. One is multicolored with orange, and the other one is green. • 1 (one) Antique book box. The difference between the two sets is the kind of "Glowy Ink" you choose. The Noodler's Blue Ghost ink works with both fountain pens and dip pens and only glows with a black light, it does not glow in the dark. 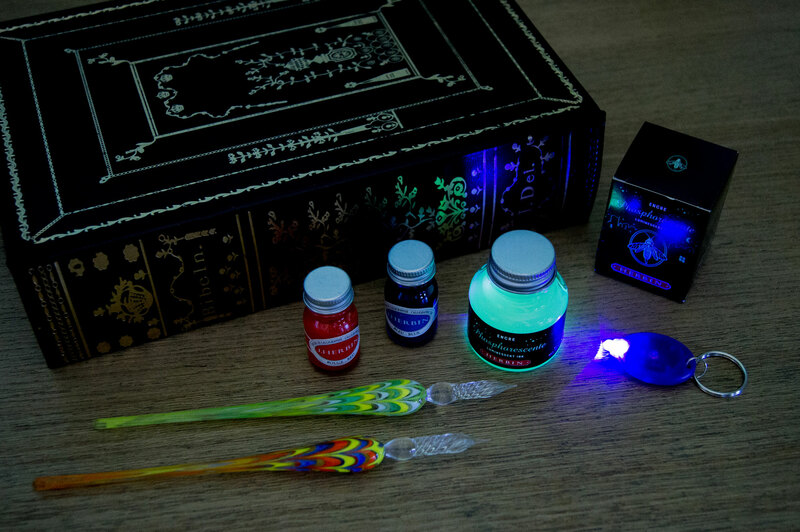 The J. Herbin Phosphorescent Ink only works with dip pens and will glow in the dark and glow under a black light. 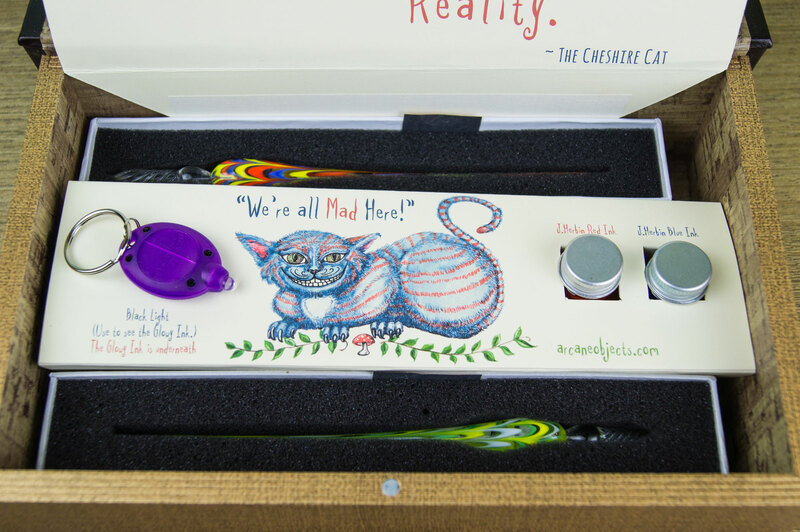 Take a big step into creativity with Arcane Object's Cheshire Cat Madness Glowy Ink Writing & Drawing Set. This unique calligraphy / glow in the dark drawing kit is available exclusively through Arcane Objects.